Earlier this month, the South Korean government's Ministry of Education, Science, and Technology announced plans for its new game shut down system. The "Cooling Off" system would restrict young people from playing for more than two hours in one day by automatically shutting down the game; gamers will be able to log-in again after 10 minutes of rest only once a day. Moreover, after one hour of play, the system would give warnings periodically. South Korea is already placing restrictions on online console gaming at night with a "Shutdown Law" that is designed to block online gaming during a nightly six-hour block. Since the end of last year and all throughout this winter, the Korean news has been focusing on bullying and the suicides of the victims of bullying in schools. The Cooling Off system is an effort to cure gaming and internet addiction, which the Ministry of Education, Science, and Technology claims to be the chief cause of bullying in schools. There were no references to scientific studies linking school violence to gaming. The government wants to improve education on game addiction for elementary to high school students. They plan to select students showing signs of video game or internet addiction and try to cure these people of their addiction. This is a very noble cause, but it also sidesteps the more important issue of student bullying and the tragic consequences that follow. First, the bully must be a game addict for this to work. Let's say that the bully is cured of game addiction. Fantastic. Now, what about his addiction to bullying? 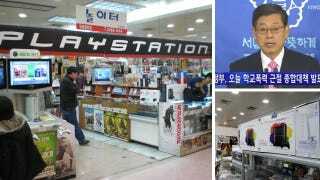 The Korean Wireless Internet Industry Association (MOIBA) remarked that restricting gaming privileges cannot solve school violence, similar to the way that comic book regulations in the 80s did not solve school violence, and further left the Korean comic industry in shambles. The Korean game industry does more business than K-pop or K-dramas, and these restrictions will endanger a continually growing business in order to solve a problem with a rather tenuous connection. Dealing with school violence is tricky, so I can't blame the government for reaching such a rushed solution. Personally, I believe that the solution to preventing bullying lies in parenting, education, and community effort, but I'm only one person. Forget about video games for a moment. People come first. The government should have been asking themselves 'How can we save the lives of our students?' I want to know their answer to that question, not the direction in which they are pointing their fingers.